Used my new Lee Undersized Carbide Sizing die to size some 32ACP brass. Pulled the recently sized 223 from the tumbler and they are ready to load. I think I am gonna just keep loading these 200 rounds of 223 while I build my 223 stockpile of processed brass. Id like to have a few thousand loaded in cans. I finally loaded up the rest of my 30/30 brass. I put some normal rather than light loads in these this time. Tomorrow is range day! Loaded a 100 rounds of 223 for range trip Sunday and punched out a hundred more 270 checks before work. Nothing... Im 200 miles from there. I figured out my 40 S&W load the other day, so I made 200 of them. There's a match tomorrow. Loaded 50 357 mag and 50 45-70 today .another tub of 2400 used up it just disappears . Went to the range and let my SRH get some fresh air, as well as my CZ and almost everything I could tote. When I got home I deprimed and re-sized all that I had shot, there are my 30/30 A.I. and 30-06 A.I. in the tumbler now. In a few hours I'll clean the 9mm, and after that I'll clean the .44 mags.. and my firearms, too. Well, after days and days of rain,( it is Southwest Louisiana after all), i cleared the shop floor, set up the casting pot, tested out several molds I recently purchased,(all good except one needs a little tlc), then got serious about casting 9mm and 150 grain RNFP .309 boolits!!!!! 100+ 30 cals, and 18 pounds of 124 rn 9mm boolits! It was a good day, all boolits drying now in prep for pc. Boy, do I wish Lee would make a 6 cavity mold in that 309-150 RNFP boolit!! I would be first in line to buy one. Sized some Lee TL314swc to .311" and loaded them over 7.1grs of Red Dot to try in the Marlin 30-30. As cast they were too tight to chamber. Last edited by Texas by God; 04-15-2019 at 01:49 PM. Had trouble getting to some of my used brass in the garage. So now major cleanup is in progress in the garage. Bought some new shelving for the loading room to help with organizing. Made a dummy round to test in the 1873. It fed like water so I loaded a bunch of these. Should make for a good night at the range. Polished a mixed batch of 06, 7mm and 303 British. Loaded 2 boxes of 450 N.E. Annealed a box 303 British. Then neck sized them for a Fredrick Beesley double rifle. Sized 3 boxes of 7mm. Went to load them and figured out that I am out of cast 7mm. Set up the pot to cast some in the morning. Primed and flared the 9mm that I cleaned yesterday, then put my few .44 mag brass into the tumbler. Then I took two different loads of 30/30 into different boxes. I had them in my loading block separated and clearly marked. These I loaded with what was left of some powder that was in almost empty cans. It will be enough to keep me plinking and fire forming for a while, as you just can't shoot a heck of a lot of ammo at one session when shooting a single shot! I broke the depriming stem on my new Lee 32 acp die set the other day. So I drilled a hole the size of a small pistol primer in my wooden reloading block for 270 Win. Then I drilled a bigger hole halfway through about the size of the 32 case. Set the case in the block, punched the primer out with an appropriate sized drill bit. Discovered a few Berdan primed brass in the package I had just bought. Taught myself to convert Burden brass. Then ordered a replacement stem from Lee Precision and a couple of hardened pins from eBay. Will test the hardened stems and report back. Then loaded 300 rounds of 9mm. Anybody looking to sell a mold for the 32ACP in the 70 to 78 grain range, pm me. 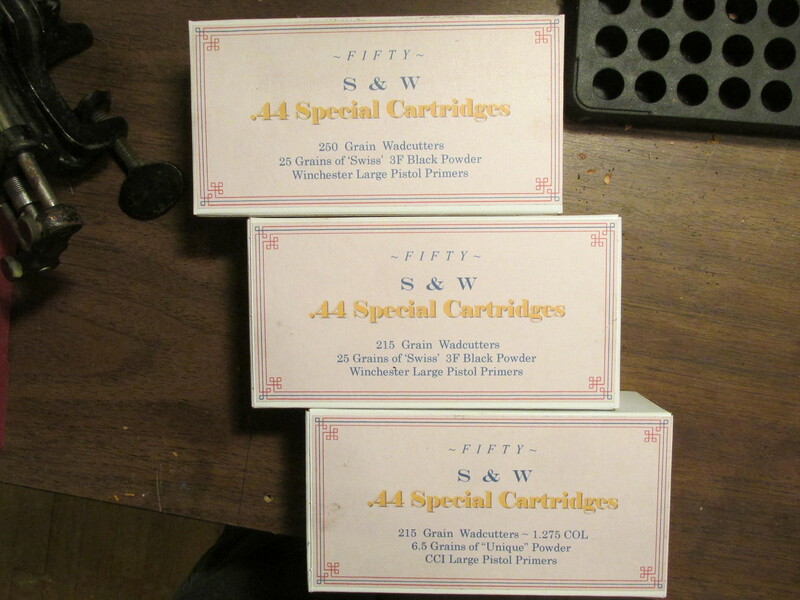 Cast 300 7mm boolits, loaded a box of 303 British and a box of 30-06, sized 100 303, sized 150 7mm, loaded 3 boxes of 7mm Mauser and set the dies for the 380/200 now that I have the right boolit mold for it. Getting lots done in the shop--too warm to hard water sail and too cold to soft water sail. And too cold for the grass to start growing so I don't have to waste time cutting it. The girls and I had fun this weekend. I cast a bunch of a couple styles of 32's and they powder coated and sized them for me. My youngest also repaired a couple sets of moulds with loose handle woods. As you can see they were being goofy! We also had a black board session when the question of "why do we size these" and "what does an M die do" were asked. Thats Great! Looks like everyone had fun! They will remember those times forever. I forgot above, I also put a new handle kit on one of my 450's. I really like the conversion, but was really hoping the the handle with a ball on the end. My old hands like the ball, like the one on an RCBS press handle. I did find out that I have a little wear in the barrel on the old 450. But with a correctly formed top punch all is well.